When Oscar Olivier was in college in the 1980s and ’90s, he did what many college students do: He protested. 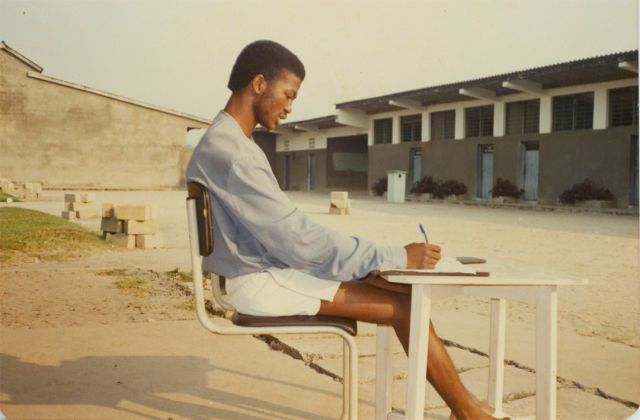 But he wasn’t in Berkeley or Boston; he was in what was then Zaire (now the Democratic Republic of Congo) living under military dictatorship, and he wanted to know why his Kinshasa university, Institut du Bâtiments et de Travaux Publics, wasn’t doling out the scholarship money it was supposed to deliver to students. A natural student organizer and representative of the student body, Olivier grew confident — too confident. One night, a group of plainclothes police officers attacked Olivier, stabbing him in the chest and waist and arresting him. By the time he was released, he knew he had to leave the country. Olivier made it to Egypt, where he learned that Congolese soldiers were there training for the Egyptian army. Fearing conscription, Olivier spent two months hiding out in Cairo, until a thought occurred to him: Israel has diplomatic relations with Zaire. He obtained a tourist visa, and with his last $50, he bought a bus ticket. A few days later he was in Tel Aviv. That was 1994, over a decade before the influx of African migration to Israel. He integrated into a community of Ghanaian workers, through which he found odd jobs and picked up bits of Hebrew. He got a job at El Gaucho, the popular Argentinian steak restaurant, bought a language book, and taught himself Hebrew. Soon he found himself organizing the Ghanaians as he’d led his classmates. 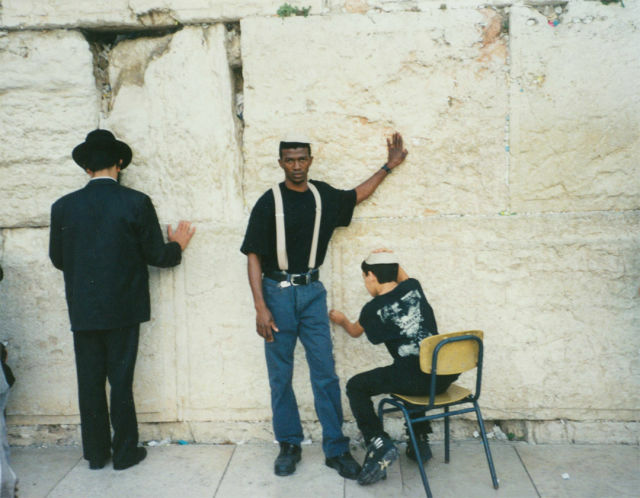 “I became the only African who could speak Hebrew,” he says. When the electric company sent his Ghanaian neighbors the wrong bills and subsequently turned off their lights, Olivier could straighten out the situation. By the time Sudanese and Eritrean refugees began pouring over the Israel-Egypt border in 2005, Olivier had the organizing and language skills to fulfill a needed role of mediator, helping the flood of migrants languishing in Tel Aviv’s Levinsky Park navigate the Israeli system and understand their rights. Oscar by the Kotel in 1996, soon after his arrival in Israel. Olivier had reinvented himself as an Israeli the same way Jewish immigrants have for decades. He learned the language, met a woman — a foreign worker from South Africa — had a baby, worked, and carved out a little space for himself in his adopted country. But he couldn’t really be Israeli. He wasn’t Jewish — at least not yet. No one knew what to do with him, so he was classified as a migrant worker and given a renewable, temporary work permit. He would become, like so many who arrived after him seeking refuge from danger and despotic regimes, a non-Jew in a Jewish state, living between the pendulum swings of the law. After all, Israel was created as a safe haven for Jews. Israel’s founders couldn’t have imagined that the beleaguered little state would one day come to be a safe haven for tens of thousands of non-Jews. 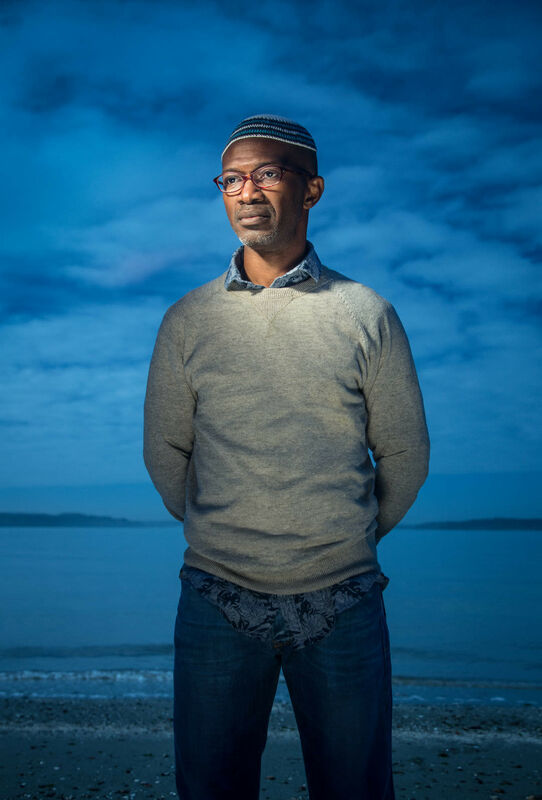 A short-statured man of 50 with a shadow of graying beard and a blue and white knit kippah, Olivier moved to Federal Way, Washington, in December 2016 hoping to receive refugee status here. When I met him over the summer he was spending his days at the nearby library while he waited for documentation allowing him to work. He wanted to get a driver’s license, pay back the lawyer he hired, and find people to speak Hebrew with. What’s with all these American Jews who don’t speak Hebrew, he wondered. At the library, we flipped through articles he’d torn from Israeli newspapers about his role as a leader among the migrant community in south Tel Aviv, every government paper regarding his case, and his certificate of conversion to Judaism. Intermittently his daughter, Esther, now 14, called from Tel Aviv, and his ringtone — the theme song from the sitcom Friends — ripped through the quiet air. Olivier’s story starts some 500 years ago, with the Portuguese arrival in Africa. He says his mother, an Angolan, has Portuguese Jewish ancestry on her father’s side, and due to her mixed heritage and skin tone — too light to be African, too dark to be European — she struggled to fit in with either community in Angola. So his grandmother moved the family to Zaire, where she envisioned an easier life and where she raised Olivier after his mother died. Looking back, he attributes his impulse to community organizing to his grandmother, who filled an untraditional role of village mediator. “I developed this instinct, when I went to school, I was like a child who defends children who are bullied,” he says. For the first 10 years Olivier lived in Israel, his predilection for activism lay dormant as he learned the language. Then, around 2005, migrants fleeing genocide in Sudan and a military dictatorship in Eritrea began pouring over the Sinai border. In the early days, Israeli soldiers at the Sinai border gave the migrants food, water, and a bus ticket to Tel Aviv or Beer Sheva. Yikealo Beyene, an Eritrean who arrived in Israel in 2008 and who moved to Tukwila two years ago, shares his memory in a 2015 episode of the Israel Story podcast. The first thing he asked the soldiers was if they knew the family of Anne Frank, and could they put him in touch with them? Beyene knew nothing about Israel or Judaism, but he had read the Diary of Anne Frank in an Ethiopian refugee camp and had translated it from English into Tingriya. The soldier smiled and told him to relax. After a few days in the military barracks, Beyene and the other migrants were sent to Beer Sheva. The bus driver dropped them off in the dead of night in the frigid desert and said he’d be back in five minutes. He never returned. “It was a very difficult time,” Olivier says. “People were sleeping outside in Levinsky Park. With children. In the rain. No bathrooms, no shelter.” At first, Olivier tried to ignore the problem. “Somehow I could explain it. You come in without a passport, without a visa. The country has to scan who you are. What happens if I defend a guy who’s going to go on a bus tomorrow and blow it up with my daughter on it? So I was 50/50.” He also understood the frustration of the residents of south Tel Aviv, most of whom are Mizrachi and have had their own set of struggles integrating in Israel. “South Tel Aviv has never been a brilliant place,” Olivier says. “In Israel, there were always people who were left aside. There was some sort of policy where [the Mizrachi Jews] were guided to go to south Tel Aviv.” Now, it seemed, the plan was to bus hordes of jobless and stateless Africans to their neighborhood. “It’s like, inside your own house your children are still hungry, and someone comes in and cooks food for their children,” Olivier offers by way of analogy. Not to mention that with the genuine refugees came a handful of hooligans who committed crimes, which didn’t help the situation. And with no right to work, inevitably some of the migrants resorted to theft. It was a bad situation made worse, Olivier admits. Under the United Nations Refugee Convention set in 1951, “Israel is bound by law to provide refuge for individuals fleeing countries deemed unsafe,” and “Israel cannot send asylum-seekers back to any country where their lives would be endangered.” Israel has complied with this non-refoulement policy by granting the asylum seekers temporary group protection status — a condition that allows them to stay in Israel until they can return home, but forbids them to work and doesn’t provide welfare or medical coverage. Israeli policy ricochets between hardline legislation and the rulings of Israel’s high court of justice, which regularly overturns the legislation as unconstitutional. Public opinion is a battlefield. Advocates for Africans and Africans themselves view the situation through the language of asylum. But according to official state language and some media outlets, the Africans are “infiltrators” and economic migrants, criminals who have illegally entered the only stable democracy in the region to make a buck. The language of infiltration comes from a 1954 law designed to keep Palestinians and their sympathizers out of Israel — amended in 2012 to allow African migrants to be jailed for up to three years without a trial. (The high court overturned this condition, but the anti-infiltration law is still in effect, and as of 2015 any African male can be imprisoned for up to one year without a trial.) As a result, the Sudanese and Eritrean nationals in Israel are at once protected as asylum seekers by a 1951 convention and characterized as criminal aliens by a 1954 law. Where does this leave the roughly 45,000 Africans eking out an existence in Tel Aviv, Jerusalem, Beer Sheva, and Eilat? In 2013, the state began to hear its first asylum requests, and since then some 5,000 Eritreans and Sudanese have filed for asylum. To date, one Sudanese and eight Eritreans have received refugee status — all after lengthy legal battles. (As a point of comparison, the United States planned to resettle 35,000 African nationals in fiscal year 2017, 9,000 of whom the State Department expected to come from Eritrea and Somalia, combined. According to HIAS, the Jewish immigration advocacy organization, 82 percent of Eritreans and 68 percent of Sudanese are granted asylum in other developed countries.) While asylum seekers are technically not permitted to work in Israel, the government looks the other way, and if employers decide to report their illegal employees, the worker is taxed and 20 percent of his or her wages — which are minimal — are directed to a fund available when he or she decides to leave Israel. deporters” get to Rwanda conducted by Foreign Policy magazine in June 2017 found that people are not granted asylum there as promised. Rather, their handlers confiscate their documents and give them an ultimatum: Agree (and pay) to be smuggled to the next country (Uganda), or be held hostage without documentation in a barricaded house in Kigali. Former asylum seekers in Israel have turned up on the shores of Europe; many have drowned en route. (Eritrean refugees make up the highest number of Mediterranean drowning deaths.) In at least one case, three men who took the offer were later kidnapped and decapitated by ISIS on a Libyan beach. In 2007, when children of migrant workers were ordered to deport, Olivier feared for his 3-year-old daughter’s future. Esther was born in Israel, attended preschool, spoke Hebrew, and lived an ordinary Israeli life. He knew he couldn’t go with her to what was now the Democratic Republic of Congo, where the government was likely to punish him for his past activism. 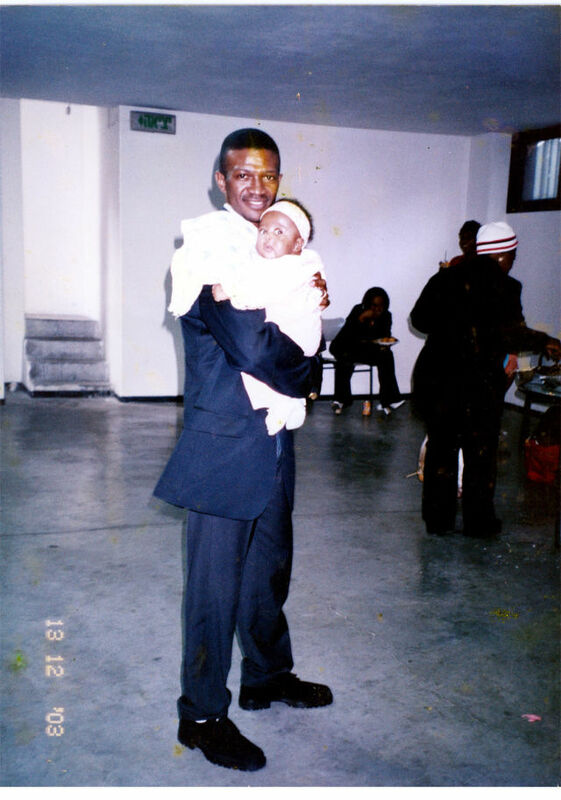 Oscar holding his daughter, Esther, in 2003. Indeed, a sense of justice drives Olivier’s Judaism. In 2006, when missiles from Hezbollah in Lebanon rained down on the northern half of Israel, he traveled to Haifa to distribute food to the families that couldn’t leave the city. “My Judaism is not connected to the fact that people accept me or not accept me,” he says. Likewise, his work between 2008 and 2013 at Hotline and then the African Refugee Development Center focused on community building in south Tel Aviv. “I was trying to make people understand they are facing the same problems, and addressing it together is easier than addressing it one side against the other,” he says. When does helping the stranger endanger self-preservation? Does “never again” apply to the whole world, or only to Jews? Whom do we choose to help, and why, and how many? From 2007 to 2009 I lived in Jerusalem, and I had to go to the ministry of the interior in Jerusalem to renew my tourist visa. The last time I tried to renew it, I ran into an almost Kafka-esque series of problems. First, I was asked to prove that I was Jewish. So I brought a letter from my childhood rabbi. But he’s Reform, the clerk, a secular woman named Chani, informed me. So I came back with a letter from my grandfather’s Orthodox synagogue, which dug up some records and attested that my great-grandfather was the gabbai. But this wasn’t good enough, because it was my mother’s paternal line. Could I bring my certificate of conversion?